ROAD TOWN, Tortola, VI - The Royal Virgin Islands Police Force (RVIPF) is reviving its Police Week celebrations this year, 2019, as it opens the way for engagement with members of the public on a social level. This is according to a press release from the RVIPF which states that the community is invited to join in activities planned under the theme: A resilient Territory; a resilient people, a resilient RVIPF. On Saturday, February 23, 2019, events will open with a fundraising walk to aid in the purchase of resources for the Autism Centre. Participants will walk from the Queen Elizabeth Park to the Ebenezer Thomas Primary School and back to the park. Walkers are asked to be at the park at 5:15am for a 5:30am start. On Sunday, February 24, 2019, the Royal Virgin Islands Police Force will have its opening church service at the St. George’s Anglican Church at 8:30am. All are asked to come and be part of this church blessing. The Force will then make way its policing commitments during elections, but on Thursday, February 28, 2019, the new Police recruits will go up against the St. George’s High School to debate the issue of whether it is time to decriminalized cannabis for recreation use at the Road Town Police Station at 7pm. Public is invited to come out in support. On Friday, March 1, 2019, Police will host its very popular BINGO night with a large cash prize at the Road Town Police Station at 7pm. Prizes of the Police Week raffle will also be drawn on that night. First prize is a 65’ flat screen television. 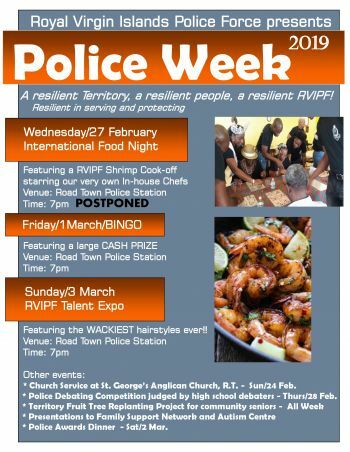 And on Sunday, March 3, 2019, Police will host its RVIPF Talent Expo to include the wackiest hairstyles ever at the Road Town Police Station at 7pm. Admission is $10. Among the other events planned are social evenings at the various police stations.